As the dust settles and pundits come out with their poll predictions, a strong sense of déjà vu pervades discussions on the latest installment of India's perennial election season. There's always a danger in theorising on exit poll results but until Monday we must work with the broad trends that seven surveys with separate sets of data have provided us. Applying appropriate disclaimers, it seems as if BJP will return to power for the sixth consecutive time in Gujarat. The party is also slated to wrest power from Congress in Himachal Pradesh in a landslide victory. However, it is in Gujarat that we must concentrate. Unlike Himachal, the party was battling several factors at once. An anti-incumbency impulse generated over two decades, lack of employment, an agrarian crisis over MSP, a fracturing of social coalition, pushback against major economic reforms and a resurgent Congress under the leadership of its new boss. The caste cleavages formed around Patidar anger and Dalit resentment made it difficult for the BJP to consolidate Hindu votes around a majoritarian cause and with Rahul Gandhi abjuring faux-secularism in favour of a temple-hopping, janeu-dhaari hard Hindutva stance, the factor of polarisation was taken out of the equation. Under the circumstances, if the exit polls are proved correct, BJP's results would be no less than a stunning achievement. 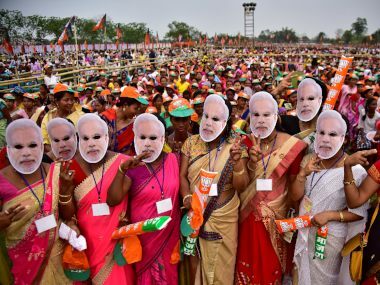 The surveys suggest that the ruling party won't be able to attain Amit Shah's ambitious target of 150 seats — and some pollsters even detect a slight dip compared to 115 in 2012 — but the larger message that goes across must be in equal parts morale boosting for the BJP and demoralising for the Opposition. 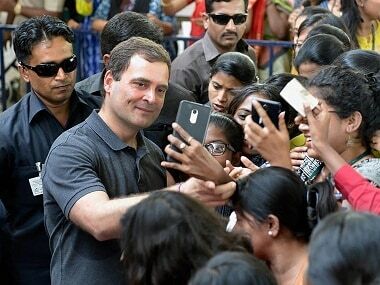 A quick glance at exit poll figures also show that Rahul's energetic campaign and rainbow coalition of subalterns and upper-caste have failed to catapult Congress to power, though its seat tally may witness a marginal upward revision. India Today–Axis poll predicts that BJP's tally may slip anywhere between 99-113 seats while Congress, which won 61 seats in 2012, may bag between 68 and 84 seats. Sahara Samay-CNX gives BJP slightly more seats between 110-120, and Congress between 65-75. Timesnow-VMR foretells a 109-seat tally for BJP and 70 for Congress. Republic-Jan ki Baat predicts that BJP will maintain in 2012 tally of 115 seats while Today's Chanakya gives the most favourable result to BJP at 135 seats. In the 182-seat Assembly, the halfway mark rests at 92 seats. 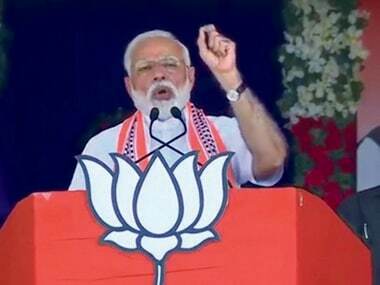 A month ago, ABP-CSDS had predicted a photo-finish between the two parties, now forecasts a clear majority of 117 seats for BJP — suggesting that Narendra Modi's determined campaigning has made all the difference. Exit polls are by nature conservative. Right from data collection, collation to interpreting the data through complex algorithms and arriving at vote share and seat tally figures, psephologists prefer to err on the side of caution. It is possible, therefore, that the margins predicted by the exit polls are in reality wider. Which brings us to the question that had emerged right after the Uttar Pradesh Assembly elections. Why did the media fail miserably in gauging public mood in one the biggest wave elections in recent times? During the entire length of the campaign, we have seen the gradual solidification of a narrative that Gujarat will be Modi's toughest test. We have been told that BJP is facing a fierce backlash from the Patidars and its social experiments have come unstuck. The traders are angry at "Gabbar Singh Tax" (GST), 'vikas has gone crazy', Dalits are angry, the farmers are angrier, while the youth are joining Hardik Patel's rallies in droves. We have been led to believe that BJP is on course for a stunning upset because people are disillusioned with the 'Gujarat model', and sensing this impending danger the BJP has "dumped" all discussions of 'vikas' and trying to polarise the electorate instead. We have also been told that Gujarat's development hasn’t been equitable and Rahul's "surprisingly effective campaign" has put BJP on the mat. 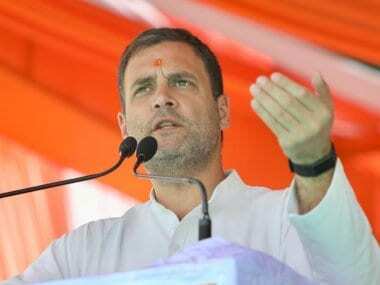 Despite propagating failed re-distributive policies of the 1980s era, attacking the 'Gujarat vision' and reinforcing the caste politics of yore, Rahul was once again projected as the 'great liberal hope' and commentators readily bought into their own myth-making. Zee Reporter to RaGa: Gujarat ke liye apka vision kya hoga? It isn't surprising to note, therefore, that exit polls predict a reality that is totally different from the one inhabited by the commentariat. Part of the problem lies in the fact that mainstream media feels an unwritten compulsion to portray every election as a "close contest" for reasons that are less ideological and more utilitarian. So Rahul Gandhi must be painted as the 'David' that will finally slay the 'Goliath'. The dynast's 'ascension' to the president's post of his 'family party' contributed in adding to the hype. Often, the reasons behind a successful campaign and an unsuccessful one lie not in catchy campaign slogans or temple visits but mundane, unsexy and diligent background work, organizational strength and on-ground performance. These factors usually go under the radar because in the era of TV-driven infotainment, keeping juicy speech excerpts of netas on loop and searching for non-existent symbolisms make for far greater drama than scouring the ground and talking to members of booth committees, local committees and other such grassroot workers. Tracing the building blocks of an election machinery and comparing the organizational structures of rival parties may get the media closer to truth but where’s the fun in that? It's far easier to interpret Modi's Pakistan jibe or Mani Shankar Aiyar's 'neech' comment as inflection points. A sober analysis would have pointed out the media's blind spots. For instance, the likely silent role played by the women voters — who account for roughly 48 per cent of the electorate — has remained underreported and unheralded. The benefits of 'Ujjawala' scheme that entitles poor households to free gas cylinders, liberates the women from the tyranny of smoke and demands less of their time in cooking process have not been properly understood. Quoting a survey undertaken by financial consulting firm MicroSave in 12 districts of UP, Hindu Business Line reported that "cooking on gas stoves helped (women) save at least 1-2 hours daily" and the women utilized this time "chatting with their neighbours, resting, or even doing other household work." Also, the intricate organisational structure of the BJP that uses grassroot connect to remain in close touch with the electorate all through the year, stresses on poll-day mobilistion or uses diverse tools such as Amul Cooperative network for outreach has more to do with BJP's electoral success than any chance remark or a temple visit. 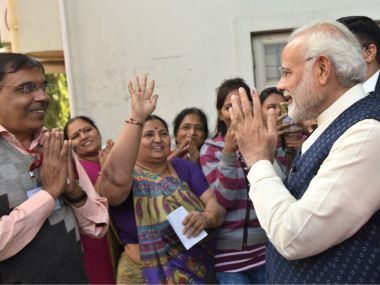 A recent piece on Firstpost details how BJP breaks down "the electorate’s composition to a minuscule level" and appoints a 'pramukh' to connect with voters, "irrespective of their pronounced political proclivity, and persuade them to vote for the BJP." Modi, for instance, had held countless booth-level meetings to mobilize voters till he served as the chief minister of Gujarat. Also, as this Hindustan Times article argues, post witnessing BJP's intricate poll machinery: "Panna pramukhs (who usually aren't active party members but sympathizers with close connect with 47-48 people) would be in touch with their booth committees. Depending on the size of the booth, the party has a 13, 18, or 25 member committee for each of the 243 booths — with a minimum of three, four or five women representatives respectively. These booth committees then constitute a Shakti Kendra. These units coordinate across a larger area, report to the campaign office, and play a monitoring role. They also have social media in charge of each Shakti Kendra." These networks help BJP in expanding outreach, keep it grounded and receptive to responses. The Congress simply lacks such an organizational strength, relying more on a franchise-type model. A thorough understanding of these factors might tell us why BJP keeps on winning. But it may also rob the elections of drama.